Police and paramedics were called in to help with the delivery. Police and paramedics in California were called in to help a woman who went into labour at a McDonald’s outlet on Monday night. 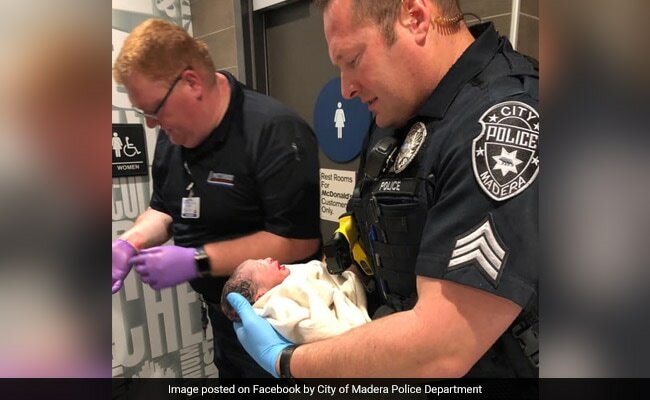 The City of Madera Police Department said in a Facebook post that the woman went into active labour while inside the McDonald’s lobby. The restaurant had to be turned into a makeshift delivery room as there was no time to transport her to the hospital. “It’s not everyday you get to help deliver a new born baby at McDonalds. Last night, officers responded to McDonalds regarding a woman who was in active labor,” wrote the police in a Facebook post, sharing a picture of the newborn. Their post has won a lot of love online. Since being posted, it has collected over 3,000 ‘likes’ and hundreds of comments. “The way that officer is looking at that baby…. it’s a proud day for Madera PD!! !” wrote one person in the comments section, praising the police for their swift response. “Great job. Glad they are both doing ok,” praised another. “I love a happy story,” a third praised. Both the mom and her newborn baby were transported to the hospital and are doing well, the post said. This isn’t the first time a restaurant has hosted a delivery. Last year in July, employees at a Chick-fil-A outlet in Texas helped a woman deliver a baby in their washroom.